It is a period that has "three dimensions": past, present and future. It serves to "purify the faith", to "purify hope" and to "purify vigilance", because the Lord will return. 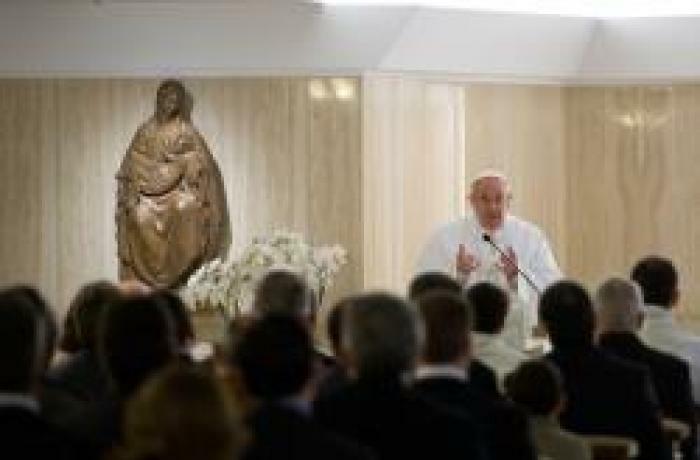 Vatican City (AsiaNews) - Advent, which begun yesterday, has "three dimensions": past, present and future and it is time to prepare for Christmas which is the descent of Jesus, but risks becoming a worldly festival, of expenses and gifts, said Pope Francis this in the homily at Mass celebrated this morning at Casa Santa Marta, inspired by the passage from the Gospel (Mt 8: 5-11) that tells the meeting at Capernaum between Jesus and a centurion, who asks for help for the his servant, paralyzed in bed. The Lord is born, the Redeemer who has come to save us. Yes, it is a celebration… [but] we always face the danger, we will always have within us the temptation to make Christmas mundane, worldly… When the celebration stops being about contemplation—a beautiful family celebration with Jesus at the centre—it begins to be a worldly celebration: all about shopping, presents, this and that… and the Lord remains there, forgotten. Even in our own life: yes, He is born, at Bethlehem, but [then what? ]… Advent is [a time] for purifying the memory of this time past, of that dimension. Because the Lord who came then will return! He will return! He will return to ask us: “How did your life go?” It will be a personal encounter. We have a personal encounter with the Lord, today, in the Eucharist; we cannot have such a personal with the Christmas of 2000 years ago: we have the memorial of that. But when He will return, we will have that personal encounter. It is purifying hope. The third dimension is more daily: purifying our watchfulness. Vigilance and prayer are two words for Advent: Because historically the Lord came in Bethlehem; and He will come, at the end of the world and also at the end of our individual lives. But every day, every moment, He comes into our hearts, with the inspiration of the Holy Spirit.